Gyoza are fried Jpaanese dumplings filled with minced meat and vegetables. They are often dipped into a sauce you mix yourself from soy sauce, chili oil, and vinegar. Sukemasa offers dumplings that are almost entirely made from ingredients grown locally. The restaurant has a friendly, welcoming atmosphere, and even a TV you can watch while you eat gyoza, or you can have the gyoza to go. These big dumplings are filled with a lot of vegetables making them easy to eat. The flavor of the pork they use is gentle, and makes the dumplings go well with both vinegar and soy sauce. If you order this set, you get 12 dumplings, rice, miso soup, and pickles. The Japanese style of eating gyoza is with rice, and although this may sound a bit weird, after a while you get used to it. Or you could just eat the rice with the pickles. Ramune is a traditional Japanese soft drink often sold in summer festivals. The drink is really sweet, but children love it. There is a marble inside the bottle, so drinking Ramune takes some practice. There is a dent in the bottle where you have to get the marble in order to drink it. The restaurant’s special chili oil has kelp in it to increase the umami taste, and it isn’t as spicy as it looks. On the right you have their special chili blend of seven spices, shichimi. They have a menu in English. 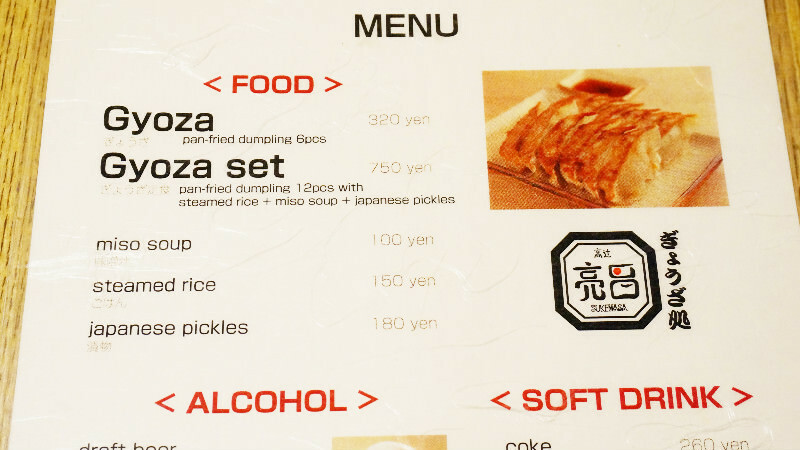 Get the gyoza set, you get two servings of gyoza, miso soup, and rice! For me, drinking Ramune is a nostalgic experience. As a child, I often tried to get the marble out of the bottle, but never succeeded. The marble just won’t come out, but maybe that is for the best. The marble not coming out may also be a metaphor for life; sometimes you don’t get the things you want. The sound of the marble hitting the bottle is really nice though! Separate areas for smokers and non-smokers.